In my support of Antelope Park in Zimbabwe and their lion program, I signed up for their monthly newsletter. I just received the newsletter for June which contained an article about the two lions, Ruvubu and Rusizi, who I joined on a bush walk. It seems that their predatory skills continued to improve and they actually made their very first kill while on a bush walk with guests. I have to admit that I am glad that I was not there to actually witness it…I am a softy and would have found it distressing even though it is totally natural. 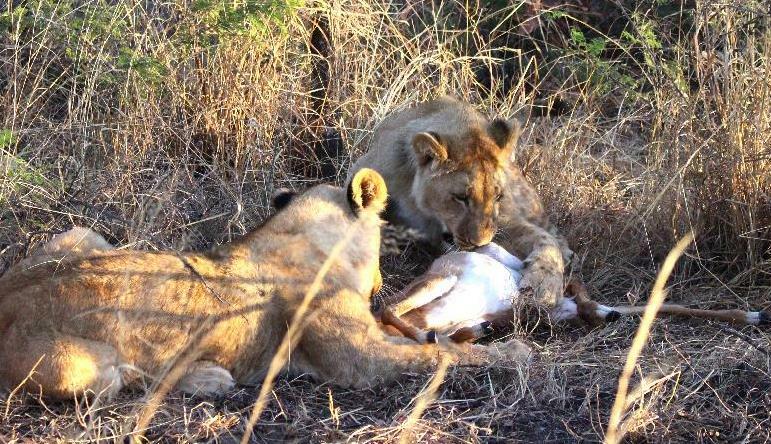 Our 11-month-old cubs, Ruvubu and Rusizi, have made their very first kill while on a walk with guests. Rusizi had her sights set on a herd of impala early on in the walk, while Ruvubu seemed a bit disinterested and wandered off in a different direction. It wasn’t long before the unmistakable sounds of an animal in distress were heard from the direction that Ruvubu had just gone. The handlers raced over in the direction of the commotion and found that Ruvubu had brought down a baby impala. His sister, Rusizi, quickly joined him and together they gained valuable experience in bringing down prey. These daily lion walks are an imperative part of the cubs’ development and give them the opportunity for invaluable lessons such as these. This is an exciting time for any young lions and at Antelope Park we offer a unique opportunity to share in this experience. Come join us on a lion walk to see for yourself how our cubs are progressing! Cheryl… is it wrong that a am dreaming of baby impala on the BBQ with sauce and spices?